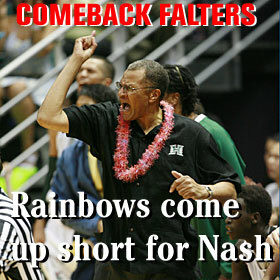 University of Hawaii Rainbow Warrior basketball coach Bob Nash directed his team on the court last night at the Stan Sheriff Center in his first game as head coach. It was not the kind of start new University of Hawaii men's basketball coach Bob Nash was looking for in last night's 73-72 season-opening loss to San Diego. Trailing nearly the entire game, the Rainbow Warriors finally tracked down the Toreros late, only to let the game slip away in the final seconds on a turnover. A judge has dismissed 25 counts of animal cruelty against a woman who was accused of operating a "puppy mill"